The collie is a distinctive type of herding dog, including many related landraces and standardised breeds. The type originated in Scotland and Northern England. The collie is a medium-sized, fairly lightly built dog, with a pointed snout. Many types have a distinctive white pattern over the shoulders. 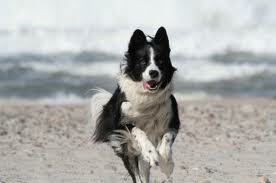 Collies are very active and agile, and most types of collies have a very strong herding instinct. Collie breeds have spread through many parts of the world and have diversified into many varieties, sometimes with mixture from other dog types. Some collie breeds have remained as working dogs, used for herding cattle, sheep and other livestock, while others are kept as pets, show dogs or for dog sports, in which they display great agility, stamina and trainability. While the AKC has a breed they call "Collie", in fact collie dogs are a distinctive type of herding dog including many related landraces and formal breeds. There are usually major distinctions between show dogs and those bred for herding trials or dog sports. They typically display great agility, stamina and trainability and more importantly sagacity. The most well known breed for herding sheep throughout the world. Originally developed in Scotland and Northern England. Not always suitable for herding cattle. Ears semi-erect or floppy, fur silky or fairly long, but short on face and legs; red, black, black-and-tan or merle, all usually with white over shoulders, alternatively mostly white with coloured patches on head. Coat can be either long or short. The Border Collie breed boasts two varieties of coat: rough and smooth. Both are double coats, with a coarser outer coat and soft undercoat. The rough variety is medium length with feathering on the legs, chest, and belly. The smooth variety is short all over, usually coarser in texture than the rough variety, and feathering is minimal. His coat is most often black with a white blaze on the face, neck, feet, legs, and tail tip, with or without tan. However, he may be any bicolor, tricolor, merle, or solid color except white. Now largely a pet and show breed, but still of collie type, and some are used as working dogs. The Beardie has a flat, harsh, strong and shaggy outer coat and a soft, furry undercoat. The coat falls naturally to either side without need of a part. Long hair on the cheeks, lower lips, and under the chin forms the beard for which he is known. 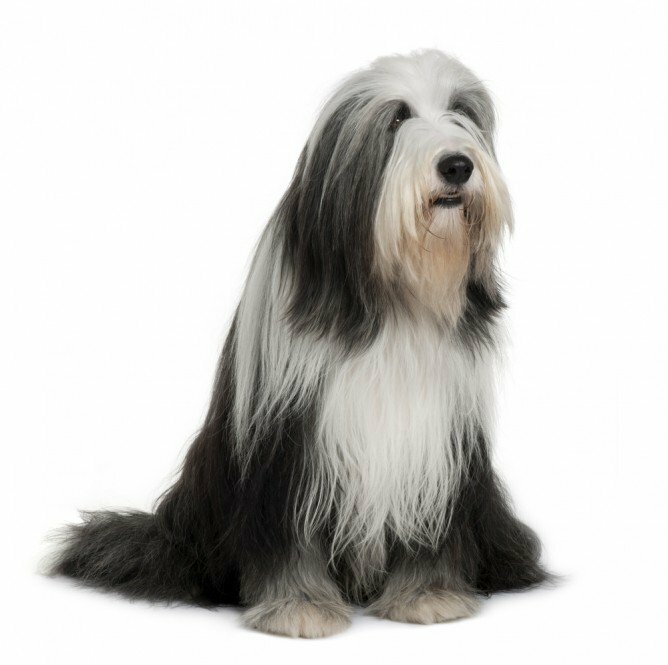 All Bearded Collies are born black, blue, brown, or fawn, with or without white markings. Some carry a fading gene, and as they mature, the coat lightens, darkening again slightly after one year of age. A puppy born black may become any shade of gray from black to slate to silver. The dogs that are born brown will lighten from chocolate to sandy, and the blues and fawns show shades from dark to light. Dogs without the fading gene stay the color they were when they were born. The white only occurs as a blaze on the face, on the head, on the tip of the tail, on the chest, legs, feet, and around the neck. Tan markings occasionally appear on the eyebrows, inside the ears, on the cheeks, under the root of the tail and on the legs where the white joins the main color. A small show and pet breed developed in England partly from herding dogs originating in Shetland. The Shetland dogs were originally working herding dogs, not collies but of Spitz type . However, in the development of the modern breed these Spitz-type dogs were heavily mixed with the Rough Collie and toy breeds, and are now similar in appearance to a miniature Rough Collie. Very small, nearly erect ears, long silky fur on body, most commonly sable or merle, with white over shoulders. Shelties have a double coat. The undercoat is short and dense, causing the longer, harsher topcoat to stand out from the body. The hair on the head, ears, and feet is smooth, but the mane and frill are abundant. The legs and tail are furry as well. Dog used in Australia for herding cattle, one of several Australian dogs interbred with the wild Dingo. 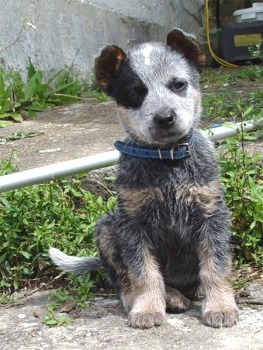 Dogs of this type are also known as Queensland Heeler, Blue Heeler and Red Heeler. Powerful build, erect ears, short-haired, mottled grey or red with solid colour patches on head, and no white. Derived from "Shags", hairy herding dogs, themselves derived from "Beards", the ancestors of the Bearded Collie. 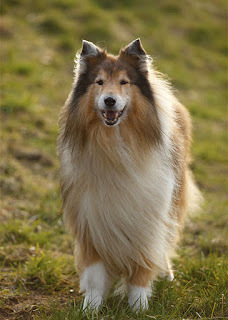 Modern dogs larger than most collies, no tail, floppy ears, long silky hair , usually grey and white. Not to be confused with the English Shepherd. 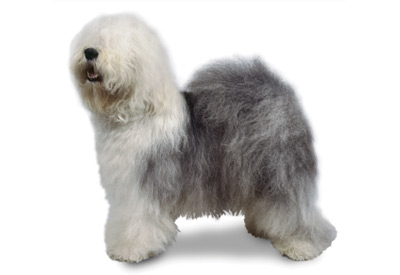 If you want a dog with big hair, the Old English Sheepdog is the one for you. This breed has hair galore: a profuse, shaggy coat that is neither straight nor curly. The breed has a double coat, with a textured outer coat and soft undercoat. Colors include gray, grizzle, blue or blue merle, brown, and fawn, usually mixed with white markings. He's certainly a large dog at 60 to 100 pounds, but his profuse coat of blue-gray and white makes him appear even larger. Known for his wonderful temperament, he's powerful, sturdy, and hardworking. Those who know and love him are familiar with his sense of humor. He can be playful and comical, although he is also the guardian and protector of his family.